Halloween is just around the corner, and boy do I have a tasty treat for you! 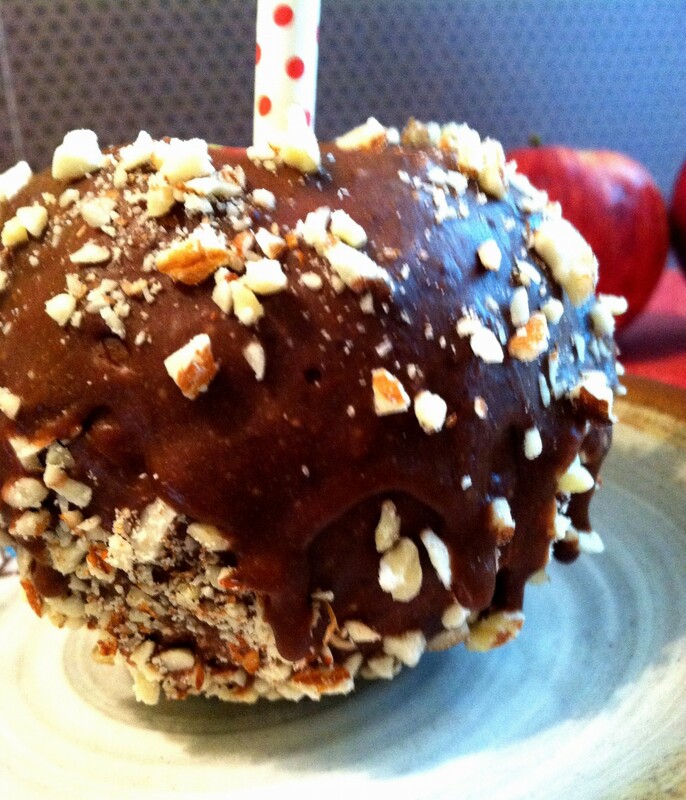 This Carob Almond “Candy” Apple is sweet, nutty, and delicious. Best of all, it is simple to make and features healthy ingredients like almond butter, carob powder, and coconut oil. Unlike the traditional version, you won’t find any refined sugar or corn syrup in this candy apple. The idea for this Halloween treat came from ogling the colossal caramel apples at the Rocky Mountain Chocolate Factory. I first heard of this chocolate confectionary chain when I was living in the Chicago area about 6 years ago. A few of my coworkers at the time had been on a community outing downtown, and part of their itinerary was stop at the Rocky Mountain Chocolate Factory (one of the great perks of being a Recreational Therapist is taking clients on community outings, which was especially fun while living in the Windy City). The highlight of their trip? The gigantic, dripping with chocolate, covered in candy bits, caramel apples that they brought back from the shop. They were huge! In fact, they sliced them like a pie and generously shared with us. You better believe I tried a slice! A Snickers bar coated apple? Yes, please! A couple of years ago, a Rocky Mountain Chocolate Factory moved into a shopping center just a few miles away, and I suspect they are all over the map now. I wanted to use carob and almond butter in this recipe because I think the combination is delectable! I had never used carob powder until this past spring, when I picked it up at the health food store out of curiosity. I was skeptical because I’ve tried it in packaged candies and snacks, where it was used as a stand-in for chocolate, and I was gravely disappointed. It tastes nothing like chocolate! If you’re able to remove its association with chocolate and appreciate its unique flavor, then I think you will really start to enjoy it. Carob has a fruity, rich, sweetly pungent aroma and flavor. Some describe it as tasting similar to dates or caramel. Combined with almond butter, I think it pairs beautifully with apples. I’ve been having fun experimenting with all kinds of recipe creations, trying carob in everything from smoothies to fudge. Although I don’t think it’s fair to compare chocolate with carob, nor do I feel that carob is an authentic substitute for chocolate, I think the two have some unique differences worth mentioning. For one, carob powder is naturally sweeter than cocoa powder, which means you can add less sweetener to your recipes using carob. Carob is also lower in fat than chocolate. An ounce of unsweetened cocoa powder has about 4 grams of fat, while the same amount of carob powder has 0 grams of fat. Carob is higher in calcium, with about 100 milligrams per ounce. Both are an excellent source of antioxidants, those scrappy little free radical fighters, that may help prevent heart disease as well as keeping us looking and feeling younger. While the following recipe isn’t something I’d indulge in every day, as far as decadent looking and tasting treats go, the Carob-Almond “Candy” Apple is a pretty healthy choice. If you use raw carob powder, raw almond butter, and leave out the maple syrup, you could even classify this as a raw dessert. The recipe couldn’t be any simpler, just mix and dip. To get a nice even coating, however, you’ll have to do several layers. This takes a little bit of extra time, but trust me, the delicious results are worth it! Worried you won’t know what to do with a bag of carob powder? I’ve got you covered! I have several more carob recipes to post in the near future. In the meantime, feel free to experiment. There are lots of ideas out there on the internet, so that package of carob powder certainly won’t go to waste. 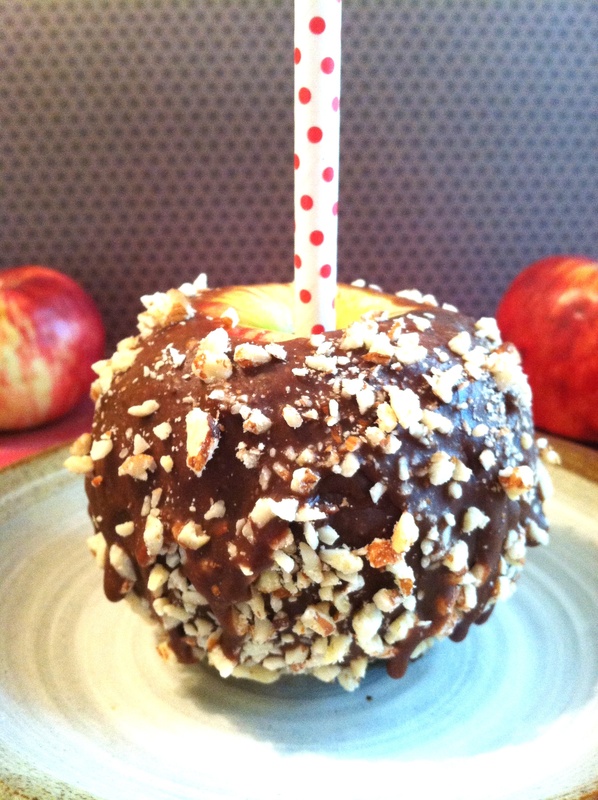 For a fun and festive Halloween treat, give these Carob-Almond Candy Apples a try! Mix all ingredients together in a small bowl big enough for you to fit your apple inside. If your almond butter is hard, you may want to mix ingredients in a small saucepan over low heat to get everything melting together, then transfer to your bowl. Once your ingredients are combined, dip in your whole apple, tilting and turning it to coat. This first layer is very thin. Set your apple on a plate and put in the fridge for about 5-10 minutes or until the layer has set. Then repeat the process, rolling the apple into the mixture and popping back in the fridge to harden. It took about 3-4 layers to get the effect in the pictures. Before placing the apple in the fridge to set the last layer, sprinkle on the chopped almonds (or other preferred topping). Store in the fridge until ready to eat. The coating will return to a semi liquid form if allowed to sit in room temperature for too long, so take it out of the fridge right before eating. For multiple apples, simply double or quadruple the recipe. P.S. Have you ever tried one of those gargantuan loaded caramel or candy apples from Rocky Mountain Chocolate Factory or Kilwin’s? Wow, thank you so much Meagan!! I am truly honored that you nominated me!